STOP!! DO NOT USE SKIN TIGHT IF YOU ARE ALLERGIC TO ASPIRIN. 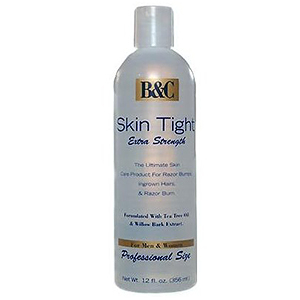 Skin Tight - was formulated specially to help reduce and control these problems, while also enhance the overall condition of the skin. Dampen affected area with cotton balls and let air dry three times a day until bumps vanish. Then apply once a day to prevent reoccurrence. For ingrown hairs or razor bumps apply morning and night until skin clears. For best result, continue usage after each hair removal process.